Get ready to rock out until you clock out! 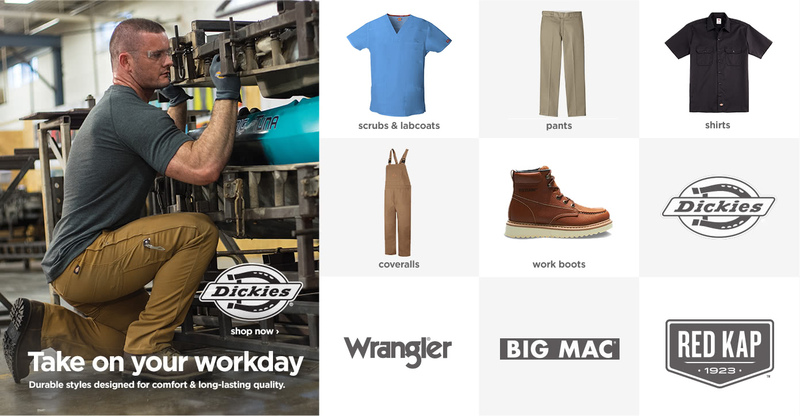 Start the day off just right with the absolute best in workwear clothes—rugged, reliable, and always there to back you up when needed. We have all of the essential work uniforms for all sorts of work—from durable and waterproof coveralls for heavy-duty activity to comfortable and protective scrubs and lab coats. However long your shift is, a comfortable set of scrub pants and a three-pocket top would go a long way towards making it better. Enjoy the way the super soft fabric flows around your body, providing unbeatable comfort and mobility all day, every day. For those jobs where you’ve got to be rough-and-ready, take a look at our work overalls and full-coverage coveralls for serious protection. Fend off strong winds and cold weather with warm and snug fleece lining. Take the heat with flame resistant fabric, and bask in the effortless comfort of all of our workwear clothing. JCPenney always has an amazing selecion of work uniforms. Shop our men's depatment today!